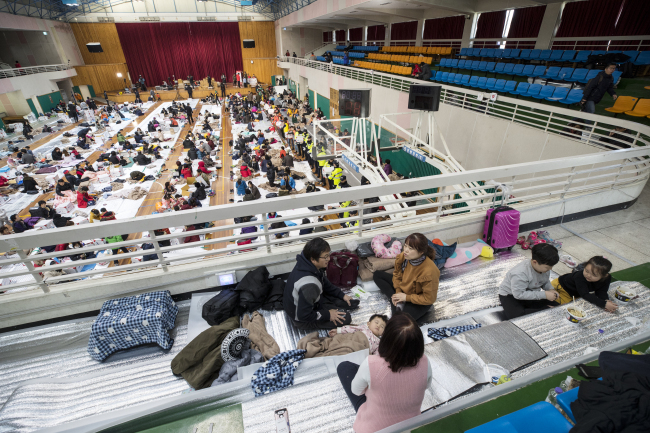 More than 1,500 residents in the southeastern port city of Pohang, North Gyeongsang Province, have been displaced by Wednesday’s 5.4 magnitude earthquake and a series of aftershocks following the initial tremor. The city was rattled by South Korea’s second-largest earthquake on record at 2:29 p.m. on Wednesday, which was followed by nearly 45 aftershocks of up to magnitude 4.3 through Thursday afternoon, the Korea Meteorological Administration said. Although there were no reports of immediate deaths, victims left homeless by the disaster tallied 1,536, and at least 57 had sustained injuries as of 6 a.m., according to the Ministry of Interior and Safety. Among those injured, two are in critical condition and 10 are being hospitalized. Those who evacuated from their homes are currently staying in 27 different emergency shelters in nearby areas, including an indoor gym. More than 1,000 houses, buildings and private properties were either damaged or destroyed with signs of fissures and collapses, said authorities. Damages in public infrastructure including schools, roads and railways were also reported. To cope with the damage, the government said Thursday it would take necessary steps in designating the city as a special disaster zone, which is a presidential-approved area that can receive financial support from the government to address damage from large-scale disasters. “Through a conversation with Prime Minister Lee Nak-yon, (we realized) the damage (in Pohang) was more serious than (our initial observation) ... which is why we have decided to follow the procedure,” Interior Minister Kim Boo-kyum said in a press briefing, referring to Lee’s visit to the disaster-affected area earlier in the day. Regardless of the decision, the government will first inject emergency funding of 4 billion won ($3.63 million), he added. The city will be designated once damage from the earthquake exceeds 9 billion won. The figure is expected to rise, the ministry previously said, referencing seismic activity that hit Gyeongju in 2016. The city of Pohang estimated the total damage to amount to about 6.9 billion won as of 6 a.m. on Thursday. President Moon Jae-in was briefed on the news on a flight back to Seoul from his eight-day meetings with members of the Association of Southeast Asian Nations in Manila, Cheong Wa Dae said Wednesday. He entered an emergency meeting with his senior aides upon his arrival. On Thursday, Seoul’s prime minister also convened a separate meeting with government officials in charge of disaster recovery to review fiscal support for the city while vowing “swift recovery” of the site. Tax benefits and cuts in utility bills for Pohang residents were also discussed. “First of all, what‘s urgent is to recover from the damage and to ease the inconvenience of Pohang citizens,” Lee said at the beginning of the ministerial meeting. Lee also stressed preparedness for a possible nuclear disaster, pointing to 12 nuclear power plants situated near Pohang and calling for heightened awareness over additional earthquakes. The state-run Korea Hydro & Nuclear Power Corp. confirmed normal operation of all 24 nuclear facilities in the nation Thursday. It also received orders from the energy minister to upgrade the seismic functions of key reactors. 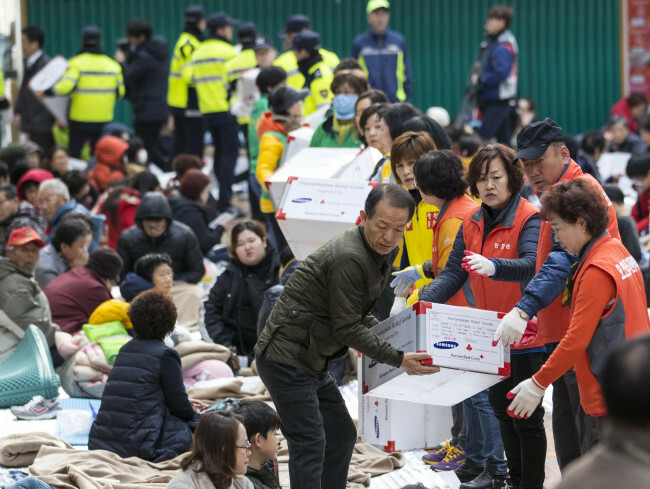 Lee later expressed his sympathy for the victims upon his visit to Pohang. The Ministry of Interior and Safety echoed Lee’s remarks by pledging to make full efforts to wrap up relief operations by the postponed date of the state-administered college entrance exam. The “suneung,” equivalent to the US’ SAT exams, was delayed this year for the first time in history, to Nov. 23 from Thursday, due to safety concerns. Gyeongju, a historic city located 370 kilometers southeast of Seoul, was declared a special disaster zone in September 2016, after it suffered from a magnitude 5.8 earthquake, South Korea’s strongest quake on record to date. Its total damage amounted to about 9 billion won and the government invested nearly 13 billion won for the recovery, according to the ministry.